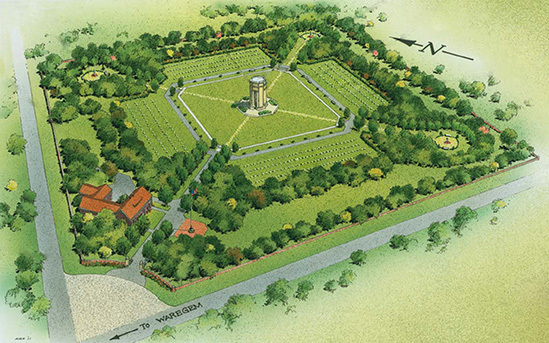 The Flanders Field American Cemetery and Memorial in Belgium occupies a 6.2-acre site. Masses of graceful trees and shrubbery frame the burial area and screen it from passing traffic. At the ends of the paths leading to three of the corners of the cemetery are circular retreats, with benches and urns. At this peaceful site rest 368 of our military dead, most of whom gave their lives in liberating the soil of Belgium in World War I. Their headstones are aligned in four symmetrical areas around the white stone chapel that stands in the center of the cemetery. The altar inside the chapel is made of black and white Grand Antique marble with draped flags on each side; above it is a crusader's sword outlined in gold. The chapel furniture is made of carved oak, stained black with white veining to harmonize with the altar; 43 names are inscribed on the Walls of the Missing. Flanders Field American Cemetery lies on the southeast edge of the town of Waregem, Belgium, along the Lille-Gent Autoroute E-17. The cemetery is within 44 miles of Brugge, Belgium and 22 miles of Gent, Belgium. The cemetery lies on the southeast edge of the town of Waregem, Belgium, along the Lille-Gent Autoroute E-17. Waregem may be reached by train from Brussels via Gent in approximately one hour; from Paris via Rijsel and Kortrijk in about five hours, and via Brussels and Gent in about five and a half hours. Paris is about 175 miles south of the cemetery, and Brussels is located about 50 miles east of the cemetery. Taxis are available from the train station in Waregem. Download the Flanders Field American Cemetery App to serve as your personal tour guide.